Bohemianism or Boho fashion immediately conjures up images of Talitha Getty, Yves St Laurent and every other wildly rich, chic and stylish celebrity under 30 living at the end of the 1960s and early 70s. That famous picture of Talitha and then husband Jean Paul Getty has inspired many a collection or editorial campaign. These days Google 'bohemian' and you would be hard pressed not to find hippy, floaty dresses, beachwear and feathered jewelry. 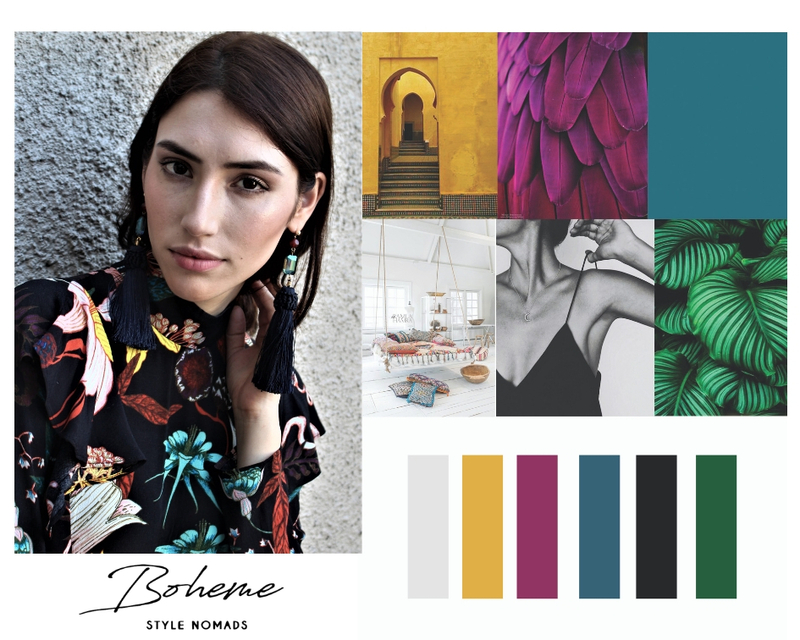 Bohemianism is often adopted by brands for their Spring Summer collections because it evokes gossamer light fly away fabrics, printed florals, or crisp white broderie anglaise and these day preferably impossibly short and usually threadbare denim shorts. Bohemia, it seems has been firmly adopted by the fashion and festival crowd. Whilst we love Cochella and its ‘festival ready’ followers, the sunlit california blonde blowing out a daisy in perfect time with the wind is quite a far cry from how we envisioned Boheme Style Nomads. Firstly we incorporated the french word for Bohemian. We looked at existing cultural artefacts that were mainstream enough to be recognizable to create the brand story or Brand Codes in order to visualize what the brand stands for. Cultural artefacts are made within a ‘Cultural Production System’ which is a description of all the agents that create pop culture and artefacts we buy into as consumers as we in turn experience and make culture. This process of producing culture sees Designers, Stylists, Photographers, Graphic Designers, Marketeers and other Creative Practioners dive back into the treasure trove of time to create a visual vocabulary that resonates with consumers. For our visual vocabulary we found ourselves more interested in another type of Bohemianism, which if you are an opera lover you probably know goes back way further than ‘free love at Woodstock’. Bohemianism was adopted by the french avant garde or let’s call them what they were, struggling artists of pre fin de siècle Paris. Artists who rejected their ‘modern’ mid-19th century life by delving into history and finding inspiration in the Bohemians of the Czech republic. Bohemia, the supposed origins of the Bohemians was technically in between what is now the Czech Republic and Germany although at the time the borders between the two cultures was quite blurred. Many have come to accept the term to describe Romany people also known as Gypsies thought to come from this region. In Europe people from this distinct culture are now referred to as travelling people. French Bohemians mythicized the Bohemians for living a nomadic lifestyle in a kind of glamorous poverty. Think of gypsy music and you conjure up images of caravans, bonfires, dark mysterious people playing accordions, fiddles, with late night revelry, dance and creativity. Romany people were always portrayed in European literature as great musicians often involved in peddling their wares at shows, or working as entertainers usually in the circus or as labourers at country fairs. On the flip side these ‘travelling people’ were and still are today vilified as thieves and ne’re-do-wells. By the mid 1800s writers had begun to use the word ‘Bohemian’ to mean something more positive, not necessarily about an ethnic minority but more to describe someone who did not have the trappings and responsibility of bourgeois life. Bohemians lifestyle was aspirational because they had managed to stay free from the shackles of commerce and lived on their wits, creativity in community and freedom from the state and inferred capitalism. Used in popular language today Bohemianism is understood to be someone who espouses an unconventional lifestyle and probably works in the creative arts. As a company we knew we wanted to create a brand that would brighten a woman’s day rather than make them slaves to the latest trend. We celebrate elements of the ‘bohemian’ lifestyle whether Czech German Bohemians or French struggling artists because we share a love of the arts and aspire to creativity, freedom and discovery. You may not have the income to live a nomadic lifestyle (yet) - these days that translates to being in a different exotic location every month, however you can discover new things just by going to your local library or doing something new. There is definitely something in the air in the 21st Century that resonates with the gypsy life. Many people if asked do not aspire to live in one place or being stuck down to one job for the rest of their life. A 9 to 5 'Mcjob' is not a Millenial aspiration, rather our thirst for travel and knowledge of other cultures has encouraged the much overused word ‘wanderlust’. Today unlike our parents generation stories of friends who give up their jobs and sail or travel around the world for 6 months or a year is not an uncommon one. Our jewelry collections are inspired by cultures across the globe and our customers probably identify more as citizens of the world than anyone nation. We aim to provide jewelry for women who are as happy to buy things from flea markets and bazaars as they are big brands. For us, fashion is not about money but self expression - mixing high and low, taking the time to make your own DIY products, cherishing heirlooms whether or not they are in fashion. A Bohemian is simply eclectic in their pursuits as they are their sartorial choices and are more than likely creative, whether they work in the creative industry or not and are definitely up for breaking style rules! We wanted to create Boheme Style Nomads as an antidote to the ubiquitous minimalism. A ‘sartorial shout-out’ to all the Bohemians and Maximalists out there who are inspired by cultures from across the globe. Our beautiful handmade jewelry made by Single Mums with no access to employment can be worn year after year which supports our preference for style over fashion. If you are the kind of girl who thinks that being without accessories is like being naked (unless you are at the beach or doing sport) then you are probably one of us.